On Sunday, December 10, 2017, about 2:50 p.m., deputies from the Jurupa Valley Police Department were dispatched to a residence located in the 9000 block of 54th Street, in the city of Jurupa Valley, reference a report of gunshots being fired. Upon arrival, deputies located a male victim who had sustained life threatening gunshot wounds. Deputies and CAL-Fire personnel rendered immediate medical aid and the victim was transported to a local hospital for treatment. The crime scene was secured and investigators from the Jurupa Valley Station respond. A search warrant was served at the residence and additional investigation identified the suspect in the case. Jurupa Valley Station investigators worked with the San Bernardino County Sheriff’s Department to locate and arrested the suspect in the 2000 block of West Ogden Street, in Muscoy. 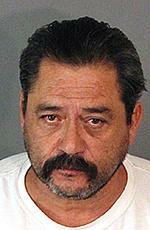 The suspect was identified as Roberto Cavarrubias, a 57-year old resident of Jurupa Valley. Robert Cavarrubias was booked into the Robert Presley Detention Center and charged with Attempted Murder (Penal Code 664/187). The investigation is continuing. Anyone with information regarding this case is encouraged to contact Investigator Olguin at the Jurupa Valley Sheriff’s Station at (951) 955-2600.